Howard Crabtree’s WHOOP-DEE-DOO! is a revue in the strictest sense of the word. It is, to paraphrase the American Heritage Dictionary, a musical show consisting of songs, skits and dances, often satirizing current events and trends. Although one generally thinks of satire as being darker and more acerbic than the cartoonish gaiety of Whoop-Dee-Doo!, the show is still a satire, albeit a good-natured one. In its absolute abandon and utter willingness to celebrate the gay sensibility, it so trivialized every issue it encounters that it leaves you wondering why any of these gay-related issues are issues at all. (After all, do we not bleed?) Whoop-Dee-doo!, like all satire, is a great leveler, knocking everything down to size. But it does it with such a flamboyant punch that you just can’t resist it. Howard Crabtree’s WHOOP-DEE-DOO! is the story (if story there can be said to be) of a wide-eyed costume designer from the Midwest and his dream of having his own show in New York. Like any revue, the show opens with a sketch (THE DOCTOR SKETCH) but all does not go well. Howard’s friend and co-star Jay is not pleased with the sketch nor, it seems, with anything about the show. But Howard has faith in his vision (WHOOP-DEE-DOO!). Still, even after a fabulous opening number, Jay is not to be appeased. Not only is the show “amateurish” but the working conditions are deplorable. It seems the shabby little theatre Howard has rented is infested with flies. Since the show is in progress and there is little Howard can do about it right now, he agrees to put up some fly paper. But what fly paper! it is gigantic, large enough to catch six foot flies– which is exactly what it does (STUCK ON YOU). It is time for Howard’s big number. Backed by two bare-chested chorus boys, he appears in a marvelous Carmen Miranda costume with the happiest tutti-frutti hat you’ve ever seen, happy because all the fruit is literally smiling. But Jay is not and ruins the number (HOWARD GOES LATIN). Defeated but undaunted, Howard introduces the next act, an invisible dance troupe (you heard me, invisible!) headed by that great operatic diva Vivian McVanish who, bejeweled and begauzed, leads a troupe of empty tutus through their paces (TEACH IT HOW TO DANCE). The next number is a solo as a young boy sings of his love doe his favorite movie star (ELIZABETH). After that comes a delightful sketch: a backers’ audition for a new musical about one of our most notorious national figures (NANCY: The Unauthorized Musical). This is followed by a scene in a “fairy bar” where real Disney-style pixies trash elves and gnomes over a few beers (TOUGH TO BE A FAIRY). Time for another solo, this time a torch song sung by a moth who’s been burned by love (BLUE FLAME). Howard then makes another valiant attempt at his big number; same song, just a different outlandish costume. Howard may be dressed as Queen Elizabeth I but Jay is not amused (HOWARD GOES ELIZABETHAN). Although Howard has his hands full with Jay, that won’t stop him from presenting the Act One finale of his show, a salute to the armed forces from the point of view of a fruit, a real fruit-one Private Banana (A SOLDIER’S MUSICAL). 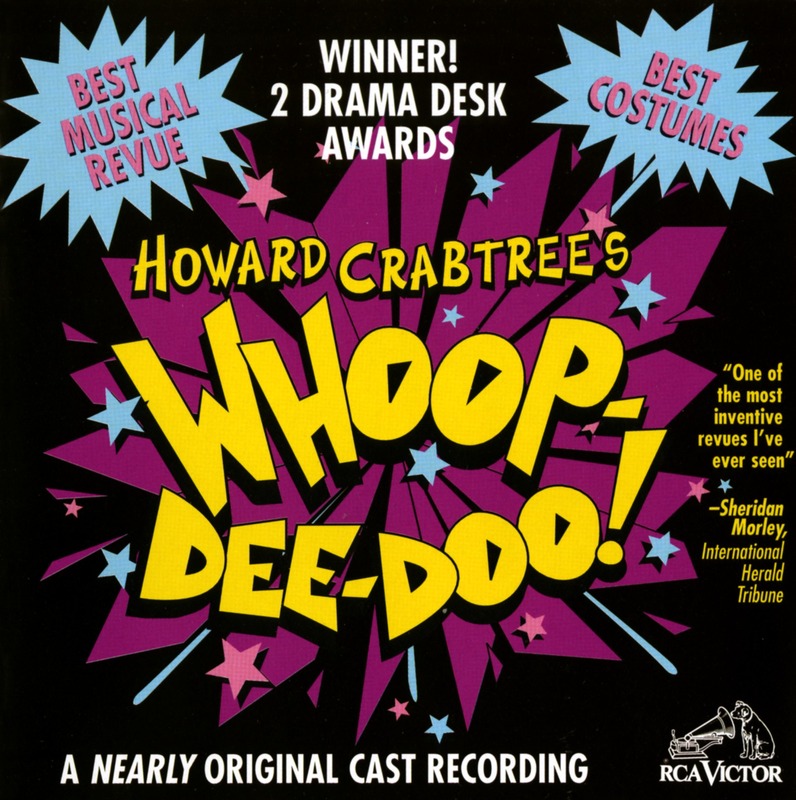 On June 16, 1993, “Howard Crabtree’s WHOOP-DEE-DOO!” premiered and created a sensation. the eight-week engagement was extended to eight months, racking up 271 performances. The show received two Drama Desk Awards for Outstanding Musical Revue and Outstanding Costume Design.